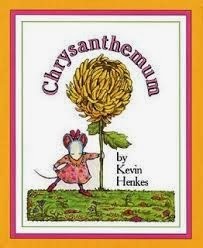 Chrysanthemum is a story about a little mouse that is in love with her name. Growing up Chrysanthemum appreciated her name and really loved how it sounded and looked. Soon Chrysanthemum started school and could not wait to hear how wonderful everyone would think her name was. However, things were different, when she got to school the other children made fun of her because her name was so long and because she was named after a flower. Chrysanthemum soon hated her name and wanted to change it. Chrysanthemum's parents tried to make her feel better while telling her why her name is so wonderful and how her name is beautiful just like her. However, it was no use, Chrysanthemum dreaded going to school and continued to be made fun of. It wasn’t until Chrysanthemum went to music class with Mrs. Twinkle and she learned that her teacher had a long name and was named after a flower. Chrysanthemum realized to again appreciate her name, herself and learned that our names make us who we are and that Chrysanthemum was an absolutely perfect just like her. I felt that this book fit element one, self-love and knowledge perfectly. The main part of this story is Chrysanthemum accepting her name and taking pride that her name is a trait that makes her who she is. Children reading this book can learn that we are all unique and to always appreciate ourselves no matter what anyone else says. This gives students a sense of dignity in their identity and they can learn about special traits that make them different than everyone else. Finally, this book can give students a sense of pride about things that make them unique such as their culture, race, heritage, physical, and personal traits; in Chrysanthemums case it was her name. This book is extremely useful for different activities for self-awareness and self pride. Student could write about their favorite characteristic about themselves. The trait could be a physical trait, a personality trait, or an emotional trait. Then children could draw a picture of themselves focusing on their best trait. This will allow the students to focus on the fact that they all have something unique and special. Another similar activity could be for students to interview their parents and find why they were named they way they are. These things will allow students to take pride in themselves and their identity.